Florida already has a reputation for being one of the most dangerous states for motorists. Now comes news that the state is also a serious threat to the safety of pedestrians. According to a report by Smart Growth America, Florida was the most dangerous state for pedestrians between 2008 and 2017. In fact, the state saw about 5,433 pedestrian deaths, which averages out to 2.73 fatalities per 100,000 residents. There might be some simple explanations for why Florida sees so many pedestrian deaths. For one thing, our wonderful weather year-round encourages more people to walk during the winter months. By contrast, people in Vermont and Maine are probably not walking during winter, or not walking very far if they do venture out into the snow. 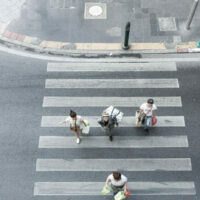 With more people walking, the number of pedestrian injuries and fatalities will naturally increase. However, there are some other explanations that are more disturbing. Florida’s many subdivisions have wide roads that often lack sidewalks and crosswalks. There is no safe way for pedestrians to cross the street, and motorists have no warning that pedestrians might be trying to get across the road. Because of the way many of our cities were designed, pedestrians are often unprotected. Overall, Florida comfortably led all states, with Alabama, Delaware, and Louisiana pretty far behind. Most of the top states were warm-weather states. However, weather alone cannot explain Florida’s ranking since California, another state with great weather, was way down in the rankings, with a pedestrian danger index only about a third as high as Florida’s. If you walk to school or work, you should be especially careful out on the roads. Remember to always cross at the crosswalk, if there is one. If there isn’t, then you should make sure that no traffic is coming before venturing out into the road. Pedestrians would also do well to wear brightly-colored clothing or put reflective tape on their jacket if they walk at night. These can help pedestrians stand out to drivers, who might otherwise overlook them. Also look for safer routes to your destination. You might need to walk out of your way to find streets with sidewalks and crosswalks, but this could be preferable to launching yourself into the road only to get hit. If you were struck by a motorist, you might be able to seek a settlement from the at-fault driver. At Bundza & Rodriguez in Florida, we are fully capable of analyzing all liability issues and determining whether you have a legitimate legal claim to compensation. If you have questions, please call us today at 386-252-5170. We offer a free consultation to the public, so contact us today.